Note: S/Sgt Paolino (TT) flew as the Top Turret Gunner and T/Sgt Stanley A. Lyman (E) flew as a Waist Gunner. Ranks and Grades at time of last combat mission. 145 ( 30 April 1944), 146, 150, 151, 152, 153, 154, 155, 157, 161, 163, 165, 167, 169, 170, 171, 162, 174, 176, 177, 178, 179, 180, 181, 182, 187 (MIA - 21 June 1944). For targets and dates, see Combat Missions. 1Lt Henry G. Way (P)(KIA) - First five missions flown as CoPilot with 2Lt Walter A. Ames as Pilot. All of the other missions flown as First Pilot. Completed 26 credited combat missions on 21 June 1944 (Mission 187). 2Lt Warren G. Raese (CP)(KIA) - Stood down on the first five Lt Way missions (145, 146, 150, 151, 152). All of his other missions flown as 1Lt Way crew CoPilot. Completed 21 credited combat missions on 21 June 1944 (Mission 187). 2Lt Eldon A. Sigurdson (N)(POW), 2Lt Julian P. Bell (B)(KIA), S/Sgt Vincent C. Paolino (Top Turret Gunner)(KIA), T/Sgt James G. May (R)(POW), T/Sgt Stanley A. Lynam (E)(Flew as Waist Gunner)(KIA), Sgt Robert E. Parks (TG)(POW). Flew on all of the 1Lt Way 26 credited combat missions. Last mission on 21 June 1944 (Mission 187). Note: S/Sgt Paolino stood down on three missions (179, 180, 181) and flew as a Ball Turret Gunner on one mission (180). S/Sgt Gene D. Wright flew as a substitute Top Turret Gunner on these three missions. Sgt Robert L. Manning (RWG) - Stood down on two of the Lt Way missions (180, 187). Flew on all of the other 1Lt Way missions. Flew on nine missions with other Pilots: 1Lt William C. Davis (195, 197); 2Lt John M. Baker (200, 201, 203, 205, 208, 214, 216). Completed his combat tour (33 missions) on 01 August 1944 (Mission 216). Sgt Paul L. LaFleur (BTG) - Flew on the first fifteen 1Lt Way missions (145 through 170) and one mission (204) with 2Lt Marvin S. Boyce (P). Completed 16 credited missions on 16 July 1944 (Mission 204). S/Sgt Garland T. Meredith (POW) flew with the 1Lt Way crew on eight missions: As Ball Turret Gunner (176, 177, 178, 179, 181); As Waist Gunner (180, 182, 187). These were his only 303rd BG(H) combat missions. Became a POW on mission 187. Other substitute Ball Turret Gunners used by the 1Lt Way crew on three missions (171, 172, 174). 21 June 1944, Mission 187, to Berlin, Germany. Received a direct flak hit just after "bombs away." The B-17 crashed in Berlin, Germany (5 KIA and 4 POW) - Missing Air Crew Report 6540. Regular 1Lt Way crewmen Sgt Manning (RWG) and Sgt LaFleur (BTG) did not fly on mission 187. Replacement crewman was S/Sgt Garland T. Meredith (RWG) Two other crews were also lost after being downed by flak hits at about the same time as the 1Lt Way crew. 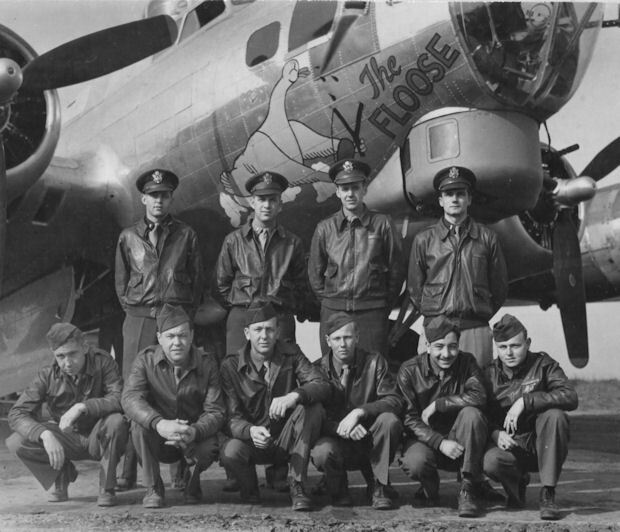 The three crews were flying in the Low Squadron of the 41st CBW-B Low Group. 1Lt Charles R. Allen (P) in 427BS B-17G 42-97096 (No name) (427BS) GN-T (1 KIA and 8 POW) - crashed at Schielowsee, Germany; 2Lt Thomas H. Morningstar (P) in B-17G 42-107002 Mairzy Doats (358BS) VK-A (9 POW) - crashed near Techin, Germany.